We were very excited to be invited to see the new Castaway Camp area in Pirate Shores at LEGOLAND last weekend. The old pirate play area was a definite favourite part of LEGOLAND for Z, so he couldn’t wait to try out the new, revamped version. Unfortunately, it wasn’t quite ready in time for our visit, but I did manage a sneaky photo and it definitely looks like it’ll be worth the wait. My brave little pirates started the day on the Jolly Rocker, which Z loved. S was a bit less keen, but it was the first time she’d been on it. We then got rather wet on Pirate Falls Treasure Quest, but soon warmed up in the dryers, which everyone thought were hilarious. 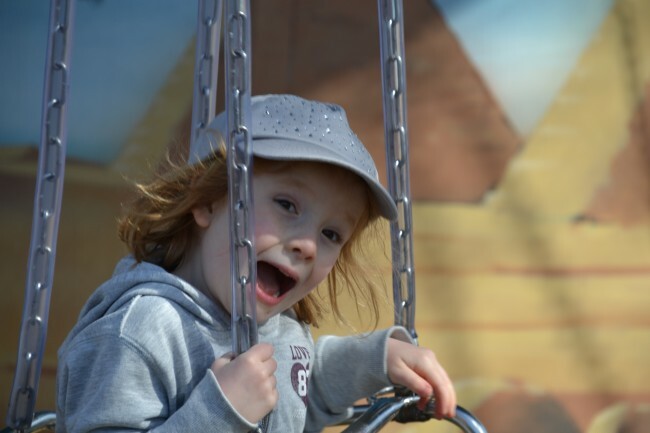 H is only 3 and was very happy to finally be 1 metre tall and be able to join her siblings on the big rides. 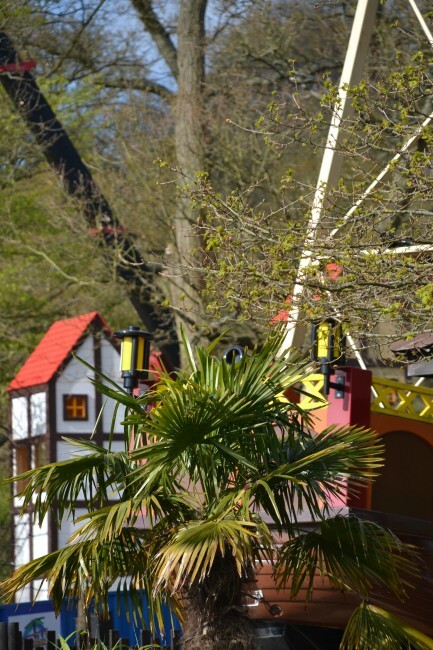 Knights Kingdom is home to The Dragon, a brilliant roller coaster which sees you flying through the tree tops after passing lots of fun LEGO models in the the castle and The Dragon’s Apprentice, which is a mini version of The Dragon perfect for smaller children or those not so keen on fast rides. Both are firm favourites of my children and a definite ‘must ride’ whenever we visit. Kingdom of the Pharaohs is another favourite land for my children. Z headed straight to Laser Raiders where you shoot your way through a labyrinth, whilst the girls and I tried the Scarab-bouncers, which was just the right level of excitement for them, S was much happier bouncing up and down here than on the Jolly Rocker. Everyone loved flapping their arms like birds on the Thunder Blazer swings as well. We always spend ages looking around Miniland, Z gets a lot of his building inspiration from the models, a big highlight is finding the London Eye and Canary Wharf where I used to work. In LEGO City we had a great time watching the Pirates of Skeleton Bay stunt show. The girls haven’t stopped talking about the pirates jumping off the tower at the end and Z was very curious as to how deep the water is. Little H was desperate to go on Orient Expedition and loved spotting the animals along the way as well as pointing out the rides we passed, although she was less happy at getting wet. 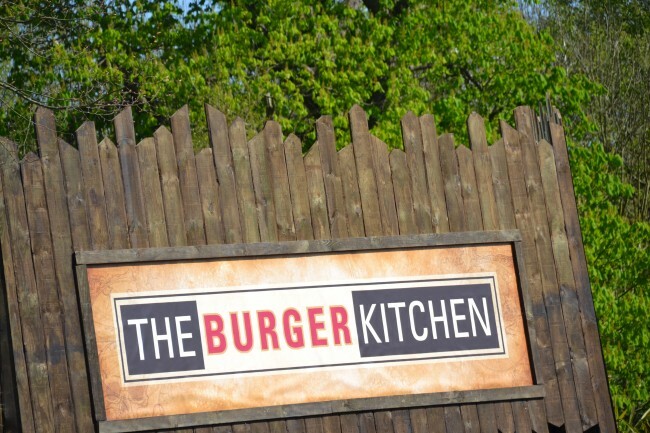 We stopped for a quick lunch break in the new Burger Kitchen and were very impressed with the burgers, fries and quick friendly service. Adventure Land is home to my personal favourite ride Atlantis Submarine Voyage. I love watching the kid’s faces light up as they spot sting rays and sharks, trying to name as many as they can, while laughing at the LEGO fish along the way. Everyone really enjoyed dinosaur spotting on Dino Safari, a lovely calm ride perfect for all the family. Little H was desperate to go on Squid Surfer and Z really wanted to try the climbing wall ( this was an extra £3 per person, and looked brilliant ) but we just ran out of time. H was very excited about getting her first driving licence having watched her older brother and sister get theirs last year. She was brilliant, driving with a big smile on her face all the way round, the car was just the right size for her little legs. Z was equally excited to try driving school again, last time he was only just 6 and a bit scared, but this time round he was much more confident and really enjoyed it. The traffic lights, roundabouts and having to drive on the correct side of the road make it a brilliant experience. Another old favourite that we didn’t try this time is boating school, everyone loves steering the boat past crocodiles and other animals, trying not to crash into anything. 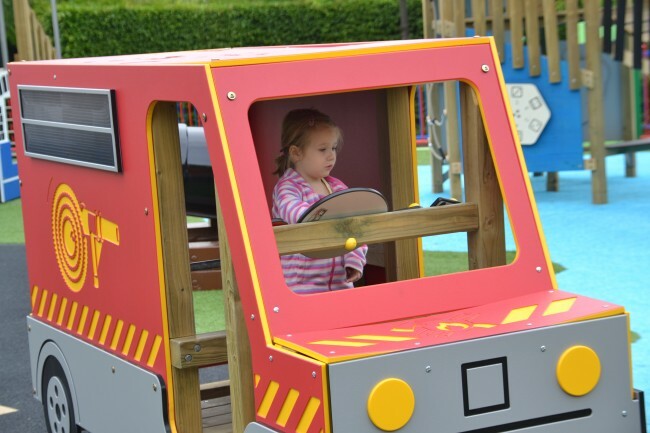 All three children adore the Brickville the new interactive play village. The grown-ups had a well earned rest while the kids climbed, jumped and ran around the police station, fire station and princess castle. We then cooled off in Splash Safari and Drench Towers, where Z loved the water slides. We just needed the weather to be a touch warmer and the kids would’ve stayed there for hours. It was near the end of our day when we walked through Land of the Vikings, so only had time to try Vikings’ River Splash, again this is a great family ride, not too rough, but we did all get rather wet. 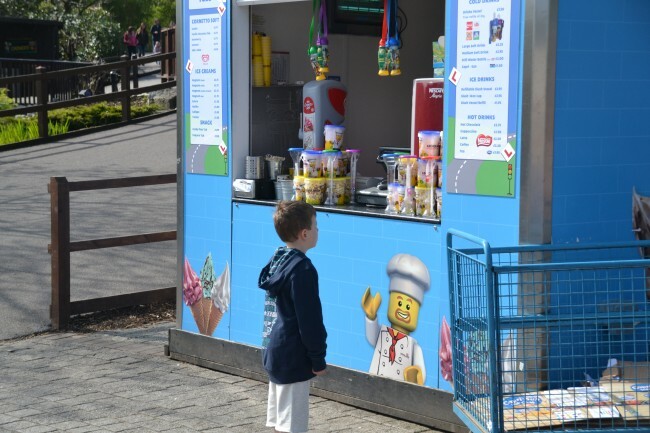 There are kiosks dotted aroud LEGOLAND selling drinks, ice creams, candy floss and other snacks, so refreshments are very easy to find. Our personal favourites are the Harbourside Coffee Co. for delicious coffee and muffins, the Ice Factory for ice cream or mini doughnuts and the Knights Table for lovely spit roasted chicken and jacket potatoes. There are shops around the park where you can purchase items and then collect from the BIG Shop at the end of the day, but we generally end up in the Big Shop anyway. Z was super happy to find a big box of bricks and road plates, while the girls have a new love for LEGO Friends. Everyone left the park exhausted but happy. LEGOLAND is my favourite theme park at the moment, it has enough excitement for 7 year old Z and my mini 3 year old thrill seeker, while still having enough slower, but equally as much fun rides to keep S happy. One day is not enough to see everything, so I’d definitely recommend getting a package deal if you stay over. We’d like to say a huge thank you to all the LEGOLAND staff who were incredibly helpful and super friendly all day long. We were kindly given tickets, special wrist bands and LEGO loot for our visit to LEGOLAND. Anya from Older Single Mum and The Healer recently posted..Timothy Sebastian Sullivan. 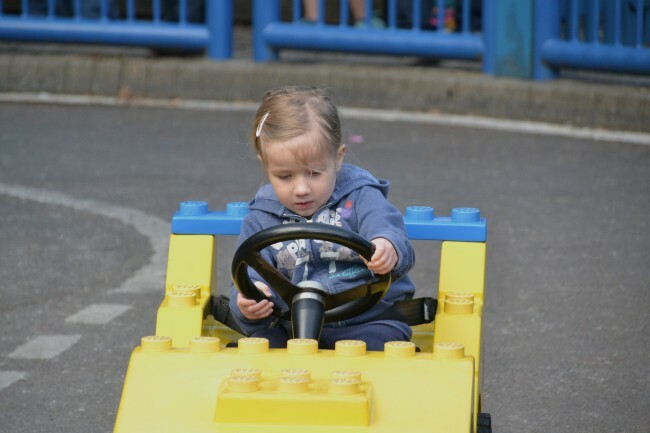 Legoland just gets better and better for little ones doesn’t it? I love how they keep investing in it. Actually Mummy… recently posted..Wot so Funee? Our first wedding. We haven’t been in aaages. MUST go again soon! 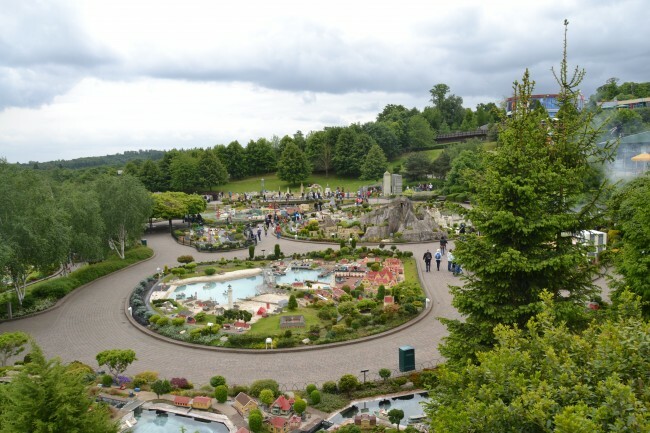 We’ve never been to legoland but it is definitely on our list now – looks fab!! It’s brill, we love LEGOLAND! we visited legoland twice and although not everything was perfect(nothing ever is) we mostly loved it there. we need to go back there soon. Oooo this looks like a lovely day out – we’ve not been for a few years and Kit and Oz are just getting to the age where I think they’d really get a lot from it – will add it to the May holidays list of things to do! Wow, I’ve not been to Legoland in years. I had forgotten how much there actually is to it. Looks like a great day out! Christopher Mansell recently posted..Happy Easter From Wallpaper Ink!